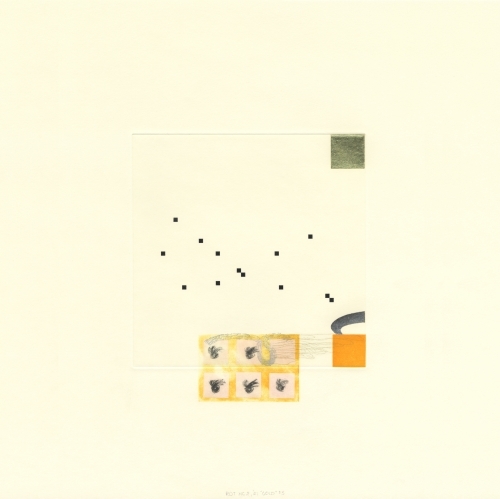 Richard Tuttle, Gold, 2001, suite of five colored etchings with aquatint, spitbite, softground, screenprinting, chine collé and gold and platinum leaf collé printed on Somerset textured Soft White 250 gsm paper 4 ¾ by 14 ¾ inches. At C.G. Boerner, Booth B4 at Art on Paper. In March, the art fairs come to New York, and I’ve put together a brief list, with descriptions and helpful links to the individual fairs. Note that many have lectures and panel discussions, so make sure to check out their websites before planning your weekend. Zürcher has invited six galleries from different parts of the world to set up in their spacious Bleecker Street Gallery. Spring/Break is the most inventive, least commercial fair, featuring curated shows of under-recognized and emerging artists. Note that this year the fair has moved from Moynahan Station to the old Conde Nast Building. VOLTA New York / 12th Avenue at West 50th Street, Pier 90 / Mar 1 – 5, 2017 / Volta is an intimate fair known for excellent solo presentations from smaller galleries. The Armory Show / 12th Avenue at 55th Street, Piers 92 and 94 / Mar 2 – 5, 2017+12126456440 / The flagship fair, The Armory is where blue chip galleries from around the world set up shop. I’m looking forward to seeing if the paintings reflect the global upheaval , or whether it’s business as usual. Obviously this fair comprises work on paper. Look for amazing prints and drawings by established artists. CLIO calls itself the anti-fair for emerging artists. “By specifically targeting artists without any exclusive NYC gallery representation, CLIO ART FAIR focuses attention on the kinds of contemporary art and interventions that are being created by independent artists the world over.” Click here for a list of participating artists. Known as the most experimental of the fairs, the INDEPENDENT often features installations and inventively installed video work. This year, however, many of my favorite galleries are on the roster, so maybe there will be more painting than usual. NADA likes to invite smaller, less established galleries that are recognized as thought-leaders in their own neighborhoods. Look for artist-run spaces and other interesting curatorial projects. NOTE: Theodore:Art will be there! You can follow fair coverage on the Two Coats Instagram, or wait for posts next week. See you out there.